Sophie Mermaid Tail Blanket Pattern (Sew-Free) Adult size. Crochet. 1 pattern 2 products. Make the tail alone and wear it as a 2 ways scarf. Sophie mermaid tail blanket pattern is sew-free, seamless and easy to make crochet pattern. 1 pattern 2 products, the beautiful tail can be made alone and wear as a 2-ways scarf. Shell stitch pattern cocoon looks like fish scales and save a lot of time and yarn compared to crocodile stitch. 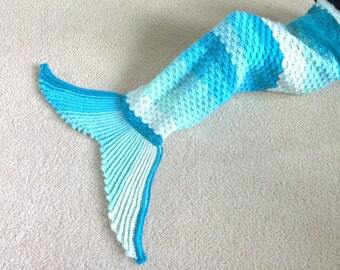 Listing is for Sophie Mermaid Tail Blanket Crochet Pattern only. Materials and the finished blanket is not included. Caron Cakes in Rainbow Sprinkles color for sample. Tail works in flat and cocoon works in round. ch - chain, sc- single crochet, dc - double crochet, fpldc - front post long double crochet, fpdc - front post double crochet, fpsc - front post single crochet, ldc - long double crochet, shell stitch -5 dc into one stitch, big shell stitch - 7 dc into one stitch, XL shell stitch -7 ldc into one stitch, sl-st - slip stitch. Sophie Mermaid Tail Blanket Pattern (Sew-Free), Crochet. Child Sizes. 1 pattern 2 products. Tail pattern is also a 2 ways scarf. Sweet Heart Mermaid Tail Scarf Pattern. A 2-ways scarf - Sweet Heart / Bow Style. 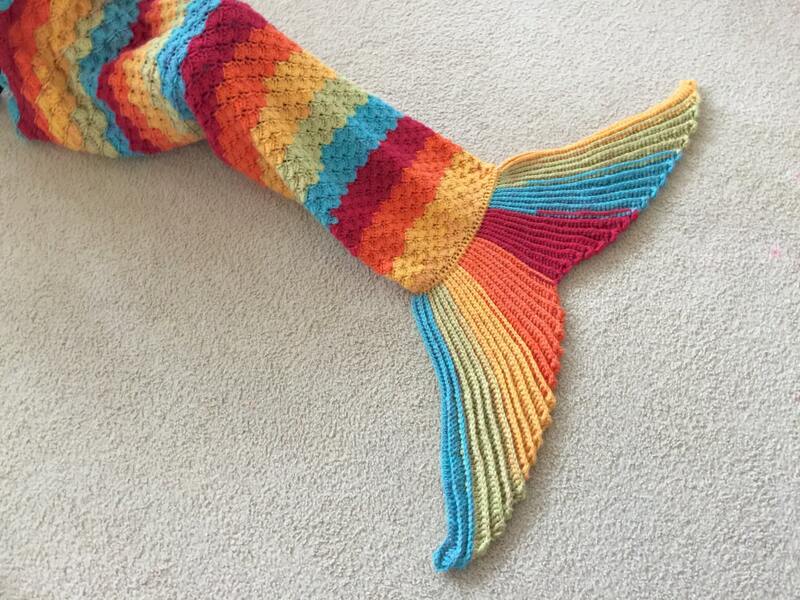 Easy, quick tail to attach on any mermaid tail blanket. Diane Dragonfly Shawl Crochet Pattern (3 Sizes: Toddler, Child, Adult). Quick and easy (basic stitches only). Great on all ages and sizes. Double Ribbed Beanie Pattern. Crochet. Reversible. Use 1 Caron Cakes for 2 hats. Fake knit style. 18-24 inches. One size fits most. Double Ribbed Beanie Pattern. Crochet Fake knit style. Unisex. Reversible. 18-24 inches. Instant download. One size fits most. Spiky Dinosaur Hat Pattern (Toddler to Child.) Fits 18-20 inches. Crochet. Instant Download. Thank you for shopping with us and letting us know your opinion. Due to the natural of digital product, our store have a no return policy. At the time of contact, the system showed all files had been downloaded for your orders, therefore we cannot issue a refund. We thrive on providing quality products and excellent customer service. Thank you for your understanding. Where can I download my digital file? After your payment is confirmed, a separate email will be sent to you with a download link. Please note: E- check payment (paid by a bank checking account) usually takes a few days up to a week to clear the payment. If you want to receive an instant download the same day within a few minutes after payment is confirmed, you will need to use a credit card, Paypal, Apple Pay or Etsy gift card for check out. I can't locate the download link email even my payment is confirmed. What should I do? Method 1: Use the search bar located near the top of your email dashboard page, type in "Etsy" and click the search button, you should able to see all the email. Method 2: Sometimes, emails sent from the same sender are grouped together. You need to click the grouped emails to access them one at a time. For example, the download email grouped into the first Etsy email, sender column shows "Etsy 2", which means there are 2 emails from Etsy sent to you the same day. Click that email from "Etsy 2" and you will see a symbol like this " ... " , click that to access the second email from Etsy. Method 3: Search your Spam folder. Method 4: Contact Etsy or Convo the shop addressing the problem. What can I do if I have a question about the pattern? Convo the shop and we will answer your questions as soon as possible.